This one’s a dream - a durable, full-featured travel bag perfect for competitions and other dance events, that even collapses for easy storage when not in use! • Trolley bag design with a sturdy handle and rugged wheels for easy travel. Wheels roll smoothly for effortless transport. • Steady and secure rack system that sets up quickly, easily holding all your costumes for quick access and costume changes. Bag is designed to hold up to 10 costumes. 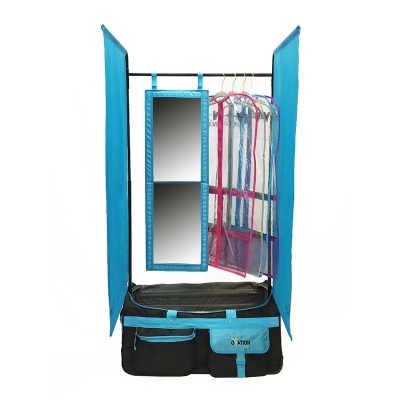 • Spacious interior with several storage pockets to fit all of your necessities in one place. Interior is lightly-colored to make seeing what you have inside a breeze. • Collapsible design allows for easy storage during the off season, while the included stability poles keeps the bag stable when in use. 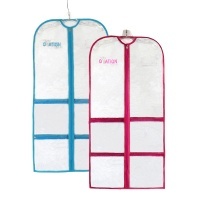 • Interior hanger hooks help keep clothing upright and organized while in transit. • Insulated pocket for that in between snack. 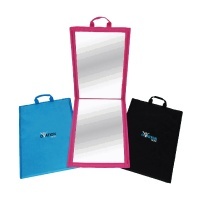 • ID Tag in holder at the end of the bag. Customize your Ovation Gear Bag with a Personalized Patch! Visit here to learn more. 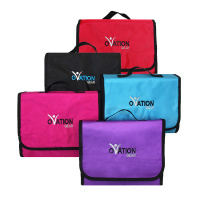 The Ovation Gear Medium Performance Bag measures 27 x 18 x 14.5 inches. The rack height fully extended is 58.5" tall. 1. How is the rack assembled? 1. Locate the white round poles and insert them into the long zipper pockets on the inside of the bag. The fit will be quite snug. 2. Once these poles are inserted on either side, you may close the zipper to secure them. This is what holds everything upright. 3. Slide the black poles into the black attachments on the inside of the bag. Once you have them in the square black openings, you may extend the poles using the push button on the side. 4. Once the black poles are inserted and fully extended, you may attach the top rack pole to complete the rack portion of the bag. For pictures of the assembly process visit our Dance Videos page here.